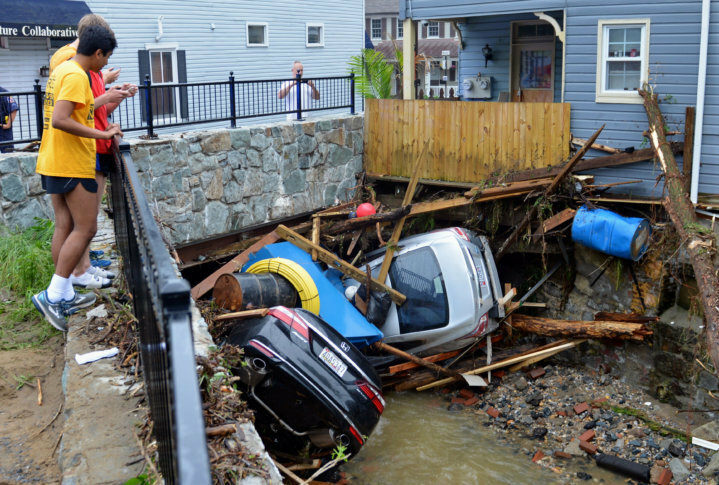 WASHINGTON — One day after flash flooding ravaged downtown Ellicott City, Maryland, officials were just beginning to grasp the enormity of the devastation. Rushing waters again turned the Howard County city’s main street into a raging river Sunday, and the damage was far worse than it was less than two years ago. Efforts were underway to prevent another flood like the one that killed two on July 30, 2016, but Sunday’s rains were unusually severe, Howard County Executive Allan Kittleman said during a news conference Monday afternoon. 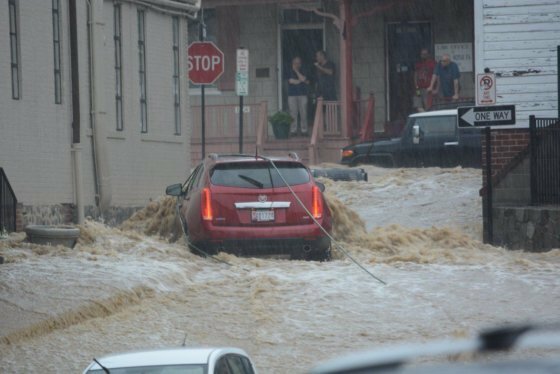 “I think Ellicott City was as prepared as it could be,” he told reporters about efforts following the 2016 flood. “When you have rain coming down as high as 8 inches or more over a certain period of time, terrible things happen. … Since 2016 in 22 months, we have done a lot of effort to get moving. John Weinstein, a Howard County Council member and 20-year resident of an area uphill from downtown, said he had never seen flooding as bad as Sunday’s. “We had flooding in my neighborhood — never seen it before. This storm was different. It was worse,” he said. Ellicott City is positioned in a valley between two major streams in the Patapsco River. That location worsened the impact of Sunday’s heavy rains, Storm Team4 Meteorologist Somara Theodore said. For a city in shock, more difficult days lie ahead. “People were just getting to where they could catch their breath, and then here comes another flood and upends their lives in devastating ways,” said Rep. John Sarbanes, a Democrat representing Maryland’s 3rd District. And even more flooding is possible for the water-logged D.C. area this week. Showers or storms are in the forecast Wednesday through Saturday. As of Monday afternoon, officials said they were still in “active rescue mode.” One man remained missing: 39-year-old Eddison Hermond, an active member of the Army National Guard. He had been trying to help find a cat as the waters rose. Hermond was reported missing to police at 12:30 a.m., but he had not been seen since about 5:20 p.m. Sunday, at the height of the flooding. County first responders assisted about 300 residents impacted by Sunday’s storm, Fire Chief John Butler said Monday. Twenty-four to 30 of those were water rescues. Swift water units from Northern Virginia and elsewhere helped with the rescue efforts. Firefighters also had to contend with two fires that might have been ignited by a lightning strike. Howard County’s 911 center handled 1,100 calls from about 4 to 10 p.m., said county police Chief Gary Gardner. In dealing with all those calls for aid, one officer had his own brush with death, Gardner said. That officer was helping a family evacuate a structure on lower Main Street when the water rapidly rose from knee level to chest level. The officer was “carried down” by the waters, the chief said, and was eventually able to pull himself to safety near the train bridge. At least one first responder shared in the collective feeling of déjà vu. “To be in some of the same buildings two years later doing the same exact thing, seeing the same exact damage, makes it a little bit difficult,” said Jeff Carl, who handles special operations for the county. Ellicott City was on its way back just a few weeks ago. The Federal Emergency Management Agency awarded the state $1,044,224 for flood-mitigation efforts in Ellicott City. The money was slated to improve a culvert on West End to protect homeowners in the area. “We put so much effort into rebuilding; it’s just heartbreaking,” said Kittleman. Many organizations and groups have set up donation calls to help residents and business owners. The Community Action Council of Howard County is asking for water, cleaning supplies and flashlights. The flooding followed hours of heavy rain that soaked the D.C. area on Sunday. Photographs, videos and tweets showed fast-moving water, overturned cars and damage to roads and businesses. Unlike in 2016, Ellicott City suffered major road damage on Sunday as the Tiber Creek washed away about 25 feet of roadway. “Here on Ellicott Mills [Drive] there’s this huge gap between Ellicott Mills and Main Street, something that clearly wasn’t here two years ago,” Kittleman said. Home and business owners on Main Street will be allowed to check their properties soon. Monday evening, Howard County officials tweeted out instructions for getting credentials for Main Street access. Some concerns are also being raised about increasing development in and around the downtown area, and if that could be partly responsible for the floods. Kittleman said discussions on that will take place at a later time. Heavy machinery, including front loaders and dump trucks were brought to Parking Lot F on Monday, where dozens of stranded cars had been pushed by flood water and were encased in mud. The cars are being towed to a central location. If you left a vehicle in the area, email HCPDCarRecovery@howardcountymd.gov and give your name; cell phone number and any additional contact information; along with your car’s make, model, color and license plate number. On nearby Fels Lane, front-end loaders scooped up mud and filled several dump trucks with the heavy goop. On Sunday, people were evacuated from portions of West End Main Street due to a gas leak; residents were urged to go to The Roger Carter Community Center, at 3000 Milltowne Drive, which was opened up to residents in need of shelter. Other places offering assistance to displaced residents are St. Peter’s Episcopal Church and St. Paul Catholic Church. Baltimore Gas and Electric said in a statement that electric and gas outages are expected until infrastructure can be inspected. Sally Tennant, who owns a craft gallery and has been in Ellicott City for 38 years, said that the flood looks a lot worse than the flood almost two years ago. From pictures, she said it looks like there is nothing left on the front of her building. “It took everything I had to get through the last one,” she said. And she knows what people have to go through to come back. “If we come back,” she said. WTOP’s Neal Augenstein, Mike Murillo, Jennifer Ortiz, Melissa Howell, Abigail Constantino, Liz Anderson, Dave Dildine and The Associated Press contributed to this report.